600 Allied Health clinics across Canada as well as in the UK, USA and Africa. 15 new clinics every month. Clinicmaster Portals – just over 50 customers currently running this solution. Scaling new offering affordably to accommodate growth and technological requirements. 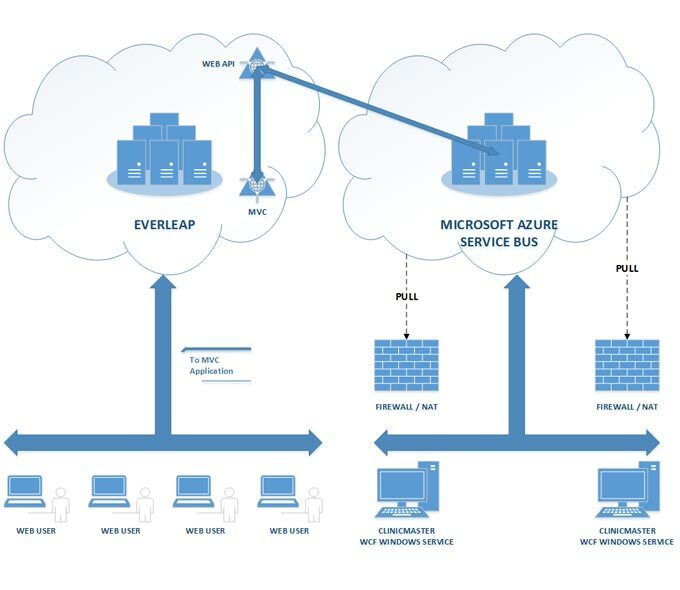 Multiple Reserved cloud servers at Everleap for APIs and portal; Hybrid solution that makes use of Everleap, Microsoft Azure and on-premises servers at client location. Clinicmaster is a Practice Management Software solution currently being used by over 600 Allied Health Clinics and Allied Health Professionals across Canada, the US, UK and Africa. Most Clinicmaster clients are in the rehab space, including Physiotherapists, Chiropractors, Osteopaths, Occupational Therapists, and Athletic Therapists. With a new web based portal offering being rolled out to their client base, Clinicmaster required a modern host that could deliver the scalable technology and infrastructure they needed, at a reasonable price for the long-run. Everleap stepped in to do just that, and then some. Clinicmaster founder and owner Max Di Paola also runs AddaTech Systems Inc., an IT company specializing in application development and a longtime customer of Everleap's sister company, DiscountASP.NET. We talked with Max to learn a little more about his business and how Everleap has assisted him with his new web-based portal offering. Everleap: Max, prior to coming on board with Everleap, your company AddaTech had been a customer of DiscountASP.NET, our shared hosting company. Can you tell us a little about what brought you to us initially? Clinicmaster: Being Microsoft .NET Developers, we were initially attracted to the fact that DiscountASP.NET stays current with the latest Microsoft technologies and makes them readily available to their clients. This was a key factor in choosing them. Our experience with DiscountASP.NET has been very positive for several years. We were happy with the service, the technology and the price point. Clinicmaster manager is a turn-key application which is used to manage every facet of the business' scheduling, billing, patient charts, stats, marketing, patient records, business analysis and more. The application is traditionally installed as a client/server application, where both the user interface screens and the database reside within the client's office. Over the past couple of years we have developed web-based solutions which interact in real-time with the application hosted on the client's premises. We refer to these solutions as Clinicmaster Portals. The first product is the Client Portal. This product is intended to provide functionality for our client's client (the patient). It allows the patient to book their own appointment, view and pay their bills online, complete surveys and forms, update demographics and so on. Features that provide real-time access and updates to the business data which typically resides physically in the clinic. It sounds like a pretty involved solution. Could you get into the details of the technology? The solution's architecture consists of several technical layers. Some layers reside on the web while other layers reside locally where the core Clinicmaster product is installed. Our architecture is known as hybrid architecture. We use the cloud and the traditional office network to deliver our solution. Some of the layers reside “local” to where the database is (typically our client's office) and several layers reside in the cloud. This allows for mobility for certain features while not compromising performance for local application users. The Portal user interacts with the application through a browser (native mobile apps are coming in the future). This is the user presentation layer, which is an MVC .NET application. This “first” cloud layer is running on IIS on Everleap servers. The MVC application interacts with a second layer which we call the Web API Message Layer. This layer is also using .NET and is hosted on a separate set of servers on Everleap. We could have used the same set of servers but decided to segregate the layers on different physical devices to allow for simplified scaling of the solution. There is a third layer which also resides in the cloud. This critical layer is responsible for connecting the web-based application with the data-store which could be anywhere in the world and often residing behind firewalls (such as on the local network within any one of our more than 600 database locations in our client's office). This is the client messaging layer, which is run on Microsoft Azure via their Service Bus and Relay Services. Can you touch on the security side of the set-up? Our solution has a ZERO-DATA footprint on the Web. No data is ever stored anywhere on the Internet. All data moves securely through all the layers using SSL encryption and all data is always saved in the SQL Server database which typically resides on the client's premises. So this new solution required a shift away from traditional hosting to a more robust hosting infrastructure. Yes, exactly. When we started the development of our Portal product offerings we needed an infrastructure that could support the many features available in Azure. Since our model uses hybrid architecture, we needed a solution like Microsoft's Service Bus and Relay Services which are available on Azure. We developed our product using Microsoft technologies such as.NET, C# and SQL Server. Prior to hosting our solution on Everleap, the cloud portion of our portals was being hosted on Microsoft Cloud Servers using their Azure Cloud Environment. But there was a problem with that? From the get-go, I knew that cost could become an issue as we scaled our solution to accommodate our existing clients as well as accommodate our projected growth. Several months ago, I was preparing a shorter term strategy to accommodate the roll-out to all our clients without breaking the bank. Our experience with only 20 or so clients on Microsoft's environment was expensive - more than what I wanted to pay for hosting services. Then, as luck would have it, our friends at DiscountASP.NET announced their new service Everleap, which is based on Microsoft's Azure Cloud technology. What made you decide to make the switch to Everleap at that point? Everleap's business model and pricing was targeted at small businesses like mine while not compromising too much on functionality. After several discussions with key reps at Everleap, I decided that the price was right and that I would give you a try. We wanted an affordable method of having all the key server environments required for success. I needed separate dedicated servers for our development team, our quality assurance team (who would be continually doing a bunch of testing), our sales team (who would be demoing our product offering) and finally several scalable and independent production servers to accommodate the current clients and our growth. We were able to attain all of the above at a very reasonable price with Everleap. Before choosing Everleap, were you considering any other cloud providers? Not really. I was only beginning my investigation to the cost/scale problem I knew I would have with Microsoft when Everleap came knocking. I figured that Everleap should know what they were doing, based on the years of experience we had with DiscountASP.NET. With the monthly fees we were already paying for the few clients we were beta-testing on Microsoft servers, I figured it would not hurt to work with Everleap, even if it only proved to be a stop-gap solution towards something better. In the end, with Everleap, the technology was there, we had experience with the team, the service was great and the price was right – so we moved forward based on all of these. So now that you have been with Everleap for some time, could you talk about the benefits of working with us? In a nutshell, the Everleap solution provides affordable scalability on a very sound platform without compromising performance, technological advancement or security. That plus the fact that your product is based on Windows Azure Pack and that you are catering to small business through price and service makes you a very attractive solution for us. What about the customer service side of things? I can't say enough about the great service we received with onboarding. The experience was - and continues to be - extremely positive. Questions are answered quickly and expertly. Over at Microsoft we often needed a 2nd or even 3rd level support person to help with complex problems or requirements. Everleap gives off a very personal, small business feel, but the knowledge, expertise and service we received proved to me that you're not only on par with Microsoft in terms of service, but in many ways are even better. I am truly impressed by the service we get. Things look very positive for us. For over 14 years we have enjoyed providing our clients with a best-of-breed product. As with everything in technology, change and evolution are constants and need to be embraced for success. That is why it is important to partner with companies who provide the latest technological advances to their clients, like Everleap. We anticipate that our clients and our prospects will truly appreciate the features, freedoms and security provided by our portal solutions. We expect this segment of our business to grow rapidly and also expect these features to attract much more business our way. In fact, this new offering is one of the reasons that many clinics are switching to us. Right now we are growing by about 15 new clients per month. Over the next couple years, we anticipate that we will have around 600 clients running on our portals. As we expand our product offering and installed base, we expect to expand the number of resources we will be using at Everleap. With their servers, services, price, scalability and security, Everleap is a no brainer for us.